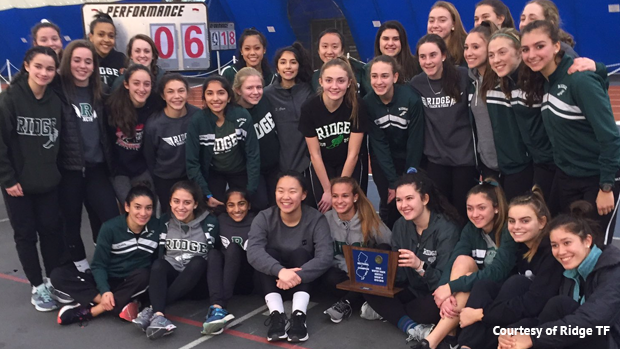 The Ridge boys and girls swept the North 2 Group 4 Sectional team championships last Sunday. For the girls this moves them to eight total and ties them for the most in indoor Sectionals history with Bernards. That is eight out of the nine years in this meet's . The boys added a second title to their trophy case. This is also the sixth straight for the Ridge girls, the last time both squads swept the Sectional was 2015. Let's dive into that Ridge scoring attack. They had two gold medal winners, Morgan Lyons won the 800m run at 2:18.09 and was second in the 400m dash at 59.30. Joy Osborne took home the high jump win at 5-02, her teammate Jennifer Hodges second at 5-0 after also placing third in the 55m hurdles with a season personal best 9.00. Olivia Cicchetti had fifth and fourth place finishes in the 400m, 59.85, and 800m, 2:22.59, Manon Stephen ran second in the 1600m, 5:10.71, and third in the 3200m, 11:18.64. Sarah Castronovo vaulted 10-0 for fifth and Tatum Peskin also picked up points with third in the 1600m run, 5:20.27. They closed the night with a silver medal in the 4x4 at 4:02.92. 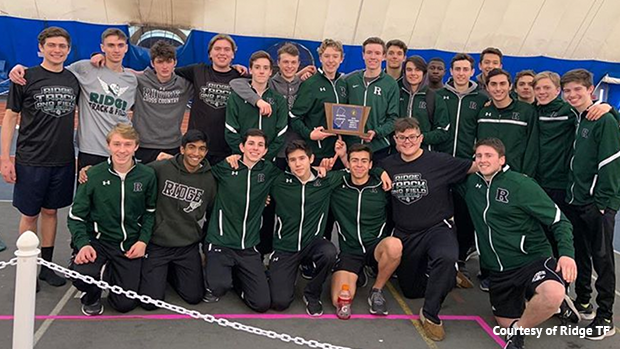 The boys team was a distance tour de force led by event winners Ryan Lindrud, 4:24.32 in the 1600m, and James Glockenmeier, 9:44.21 in the 3200m after having to "kick it in twice". 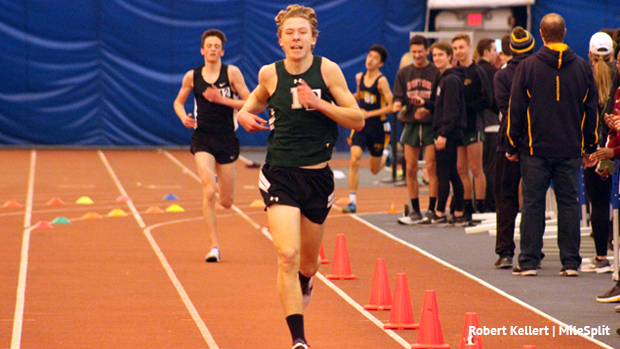 That 1600m race was huge for Ridge because of their 1-2-3 finish, Will Pinto second at 4:28.30 and Sam Lewis third 4:28.62. They also had three placers in the 3200m thanks to Ryan Lindrud second at 9:51.50 and Jackson Barna 9:53.87 in fifth. Luke Roberts took third in the 400m running 51.52 and their 4x400m team brought home fifth place. The pole vault had a solid points grab as well with Alex Petric and Kevin Korn both clearing 12-06 for fourth and fifth. 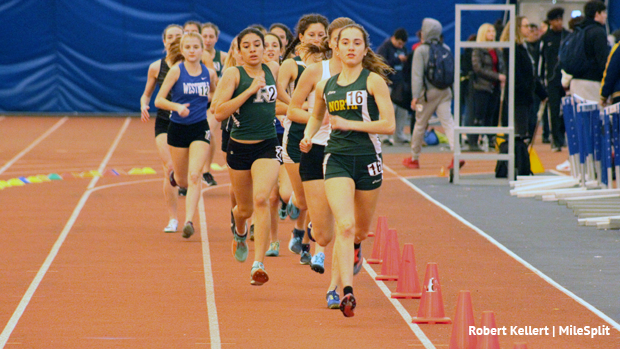 Other highlights from this meet... Emily Nugent of North Hunterdon ran a 10:57.96 Section meet record to win the 3200m. Shauntae Nelson of Piscataway posted a 58.40 to take the 400m, she was also on the winning 4x400m squad that ran 4:02.73. Chaa-nah-yah Brathwaite of Elizabeth ran 7.35 to in the 55m dash. Laura Baeyens of Watchung Hills won the 1600m at 5:09.14, her teammate Gretel Jelmert also won the pole vault at 11-00. Westfield's Lauren Triarsi took home the 55m hurdles running 8.82 and Erica Lawrence threw 36-04.5 for the win in the shot put. On the boys side Mario Heslop won the 55m and 400m dashes running 6.37 and 50.03. That 55m dash time broke the Section's record previously held by Akeem Lindo of East Orange at 6.51. Heslop's teammate Kumi Osei took home the 55m hurdles title at 7.83. Dillon Adamy earned the win in the 800m running 1:58.34. Elizabeth continued their stellar season in the 4x400m winning a great race with Westfield 3:26.68 to 3:26.99. Bradley Jelmert made it a sibling sweep of the pole vault winning with a height of 14-06 tying the meet record. Kyle Lipscomb of Linden hit 57-08.25 in the shot put for gold.